Which social media channels should we use? How do we price our latest product? Where can we get the best marketing results? In a world where competition levels are high, the only way to get ahead in your industry is to find out what your clients need from you. For years, we’ve been guessing at the answer to this question, but the days of assumptions are finally over. Now, all you need is one simple thing: a buyer persona. A buyer persona (sometimes known as user persona or target persona) is simply a representation of your preferred customer. Personas consolidate all of the information you already have about your target audience into a single document that you can use as a reference when making decisions about marketing, product packaging, or even pricing. 71% of companies with documented personas exceed their revenue and lead creation goals. So, why are buyer personas so effective? The simple answer is that they allow you to step into your customer’s shoes for a little while. With a persona, you can design a website from the perspective of the user that’s going to access it every day. With a different persona, you can explore your social media marketing strategy and update your influencer campaigns. A buyer persona gives a face and a name to all of the information you have about your audience, so you can begin to think about your business choices from their perspective. After all, when you’re facing a crossroads in planning for customer preferences, it can be difficult to draw conclusions from graphs and statistics. It’s far easier to visualize the needs of a specific person – even if it’s a person you made up. So, how do you create your own buyer personas? According to studies, buyer personas may be the ultimate way for companies to understand their audiences. The more you know about your customers and what they want from you, the more you can adjust your business strategies accordingly. For instance, 82% of companies with buyer personas have been able to create a better value proposition for their brand. Your marketing metrics: If you’ve been tracking your strategies up to now, you should be able to see which of your campaigns have had the best impact on your audience. Web analytics: Tools like Google Analytics can help you to dig down into the demographics of the people who visit your website and convert into customers. Surveys and social media questionnaires: What better way to find out what your audience wants than to ask them? Issue surveys and reward the clients that respond with a discount code or gift. One particularly good way to find more information about your personas if you’re just launching your business for the first time is through competitive analysis. Whether you’re just getting started with your company, or you’re reaching out to a new target audience, your competitors are bound to know more about your target audience than you do. Do some digging to find out what kind of keywords they target in their campaigns, and check their websites to look for hints on the kind of customer they’re interested in. During your competitive analysis stage, make sure to keep an eye out for any audience segments your competitors aren’t targeting, that might be perfect for your company. As you begin to develop your buyer persona strategy, you’ll probably discover that your company is targeting a multitude of different audiences. While it may be tempting to try and cover everyone under the same banner, remember that the more personalised your business strategies are, the more effective they become. Look at marketing, for instance, persona-based content marketing can increase customer engagement by six times, compared to targeting cold leads. Splitting your audience up into different segments is a great way to make sure that you can customize your outreach strategies. While there’s no limit to the number of personas you can create, it’s worth noting that if you push too far, you could end up confusing yourself. To walk the line between too many personas, and not enough, it’s often a good idea to stick to no more than 4 buyer personas at a time. Once you’ve got your four (or fewer) audience segments lined up, you can begin to build out your character profiles for them. Remember, the information listed below is just a starting point, personas are completely customizable, and you can add any extra information that you might find helpful along the way. Start with one persona segment at a time and address the basics as though you were creating a character for a story. Image: Uploading a photo of your buyer persona can help you to resonate with them on a deeper level. It sounds strange, but human beings are far more capable of stepping into the shoes of another person if we can visualize that individual first. Demographics: This section will give you an insight into the behavioral practices, background, and lifestyle of your buyer persona. Collect as much information as you can using a tool like Google Analytics, and cover things like location, age, marital status, and even gender if possible. Character/Archetype: What kind of person is your persona? Are they more a brave innovator, or someone who likes to stick to something that’s comfortable and familiar. How would this affect the way they use your product? At this point, you should have a basic overview of your buyer persona. The audience you want to appeal to will be gradually coming to life. However, if you really want to get the most out of your personas, then you need to dive as deep as possible. When it comes to the benefits of buyer personas, 56% of companies say that they’ve created higher-quality leads just by getting to know their customers. However, you can only achieve those kinds of results, if you’re willing to uncover everything there is to know about your audience. Description: Describe your persona in a few key words based on their motivations, priorities, work ethic and personality. Are they an energetic and outgoing person, or a disorganized introvert? Use adjectives that help you to clearly define how this persona differs from not only other people but the other audiences you might try and target. Goals: What does your persona want from a product, service, website, or marketing campaign? Depending on what you’re creating your persona for, you’ll need to understand what their motivating drivers are. For instance, some personas might prefer to see an informative blog post than a beautiful advertisement. Others might want an interactive webpage, over one that’s packed full of information. Frustrations: What’s currently stopping your persona from getting what they want? What do they need that your competition simply isn’t providing, or what concerns do they have that you might be able to help them overcome? This section is where you can start to highlight the features of your product, website, service, or advertisement, and what they mean to your persona. By now, your buyer persona is a highly fleshed-out and in-depth character. By the time you’ve finished writing, you’ll not only have a powerful business document, but you’ll also have a deeper insight into your target audience. Remember, 90% of organizations using personas have been able to benefit from a clearer picture of who their audience is. The brands your personas like (besides yours): What kind of companies are your personas likely to be drawn to, based on what you know about their personality? Are they going to prefer a company that’s all about innovation and creativity, or will they invest more into a business that has an environmentally-friendly side? How will they interact with you? Finally, think about how your audience is likely to connect with your business, and how you can begin to learn more about them. Are you planning on expanding your brand awareness through word of mouth marketing on social media, or would you see better results with television advertisements? Once you’ve covered all of these last points of information, make sure that you share each of your buyer personas with the rest of your company. 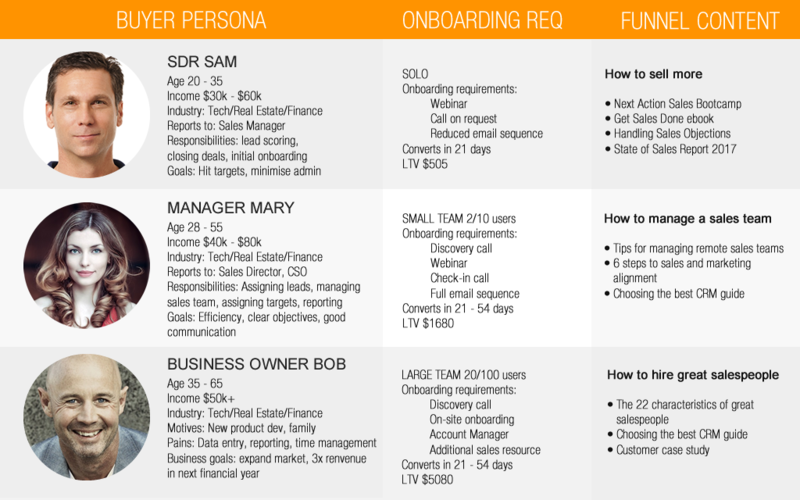 These personas should be guiding documents that your team members can refer to when making customer-related decisions. Remember, you can always come back and update your personas as you continue to learn more about your audiences. Today, there are countless new companies entering the marketplace all the time. The only way to stay ahead of this constant stream of new competition is to find a way to build loyalty among your customers. The steps above will help you create a map that you can use to guide every decision you make about your client’s needs, whether you’re building a brand-new segment of your website, or just creating a new marketing campaign.